With no little pride, Argon 18 will officially unveil next week at the Interbike show its long-awaited E-114, a new time-trial/triathlon frameset that features a completely renewed rider/bike interface. This machine stands out for its ONEness concept front end, a completely integrated aero and stemless fork/aerobar combination that allows for an unprecedented integration of rider and machine from both an aerodynamic and ergonomic standpoint. This unity of purpose and design extends to the frame, fork, headset, bullhorn and aero bars, brakes and levers as well as a reversible carbon seatpost (76/78º). Truly the star of Argon 18's 2008 collection, the E-114 was developed over the past two years in the context of Project Element 114, as a result of which Argon 18 was awarded the Institut Design Montréal's first prize for best industrial design. The first E-114 prototype had already created a sensation last fall when it was displayed at Interbike. 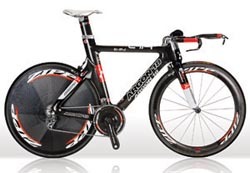 The new collection's catalogue can be downloaded from Argon 18's Web site: www.argon18bike.com. About Argon 18 With headquarters in Montreal, Canada, since it's inception in 1989, Argon 18 has created an enviable position for itself in the cycling world. All Argon 18 models are designed by ex-Olympian Gervais Rioux and stand out from the rest thanks to unique designs that combine proven, classic principles and cutting-edge technologies resulting from fundamental research. Distributed in 31 countries, Argon 18 bikes exhibit an optimal balance between comfort, rigidity and light weight. This year Argon 18 athletes won two Canadian Road Championship Titles. Previously in 2006, Argon 18 became three times World Champion in triathlon thanks to the remarkable talents of Canadian Samantha McGlone (Ironman 70.3) as well as Danish Torbjorn Sindballe and Bella Comerford from Scotland (LD Triathlon Championship).